As Darksword Armory swords continue to get more ornate, complex - and consequentially move towards the higher end of the sword market - some of the older classic models need to make way for the new.. 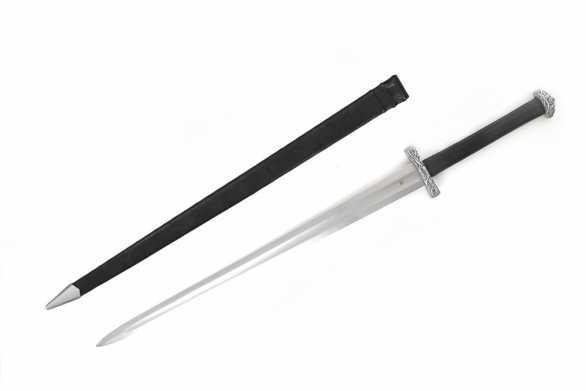 This sword is one of the models to be discontinued - and so to clear the stock is being liquidated at a previously unheard of price.. So from now until it is sold out and gone for good, you can pick this sword up with a $75 discount - PLUS as usual you still get FREE SHIPPING and FREE SHARPENING! Don't miss out - once they are sold out they are gone for good.. Please note: This version has the basic wood core, leather wrapped scabbard option. Long have the Norse sagas inspired authors, historians, poets and film makers. The Icelandic and Kings sagas present some of the most culturally rich and elaborate accounts of Viking life. Through them, we learn of Norse customs, traditions, and beliefs. At the forefront of this culture, is the consideration of art as a central focal point in Norse life. The Vikings raided and colonized wide areas of Europe between the 9th to the 11th century. Whereas the initial motives for the migrations are unknown, historians unanimously agree that their disruptive influence profoundly affected European political history and trade. Widely recognized as superior craftsmen, the Vikings created remarkable Jewelry, Weapons and ships, known as Drakkars or Knarrs. The Ships were not only constructed for functionality, but as work of art. Viking ships were embedded with anthropomorphic figures leading insight into their beliefs and superstitions. The Viking love of riddling phrases and schemes of rhyme yielded a rich poetic tradition. This tradition found itself not only in their poetry, but also on their ships, weapons and jewelry. At the center of this fierce nomadic culture, stood the Viking sword. Broad blade with a deep fuller, the Two handed Viking sword is a testament to the fierce Viking culture depicted in the Various Icelandic sagas. 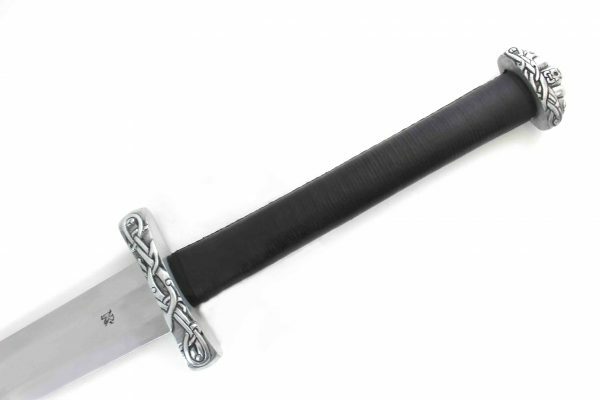 Sturdy and resilient, the Two handed Viking sword is everything a Viking weapon should be; brutish, resilient and built to last. 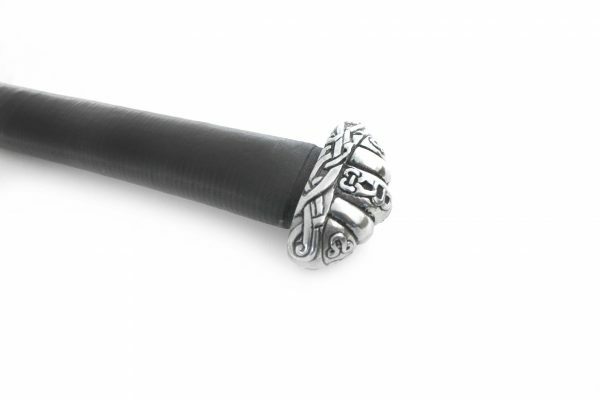 Individually crafted by our staff, the Two handed Viking sword is a testament to the warrior life and artistry of the Nordic peoples. Sharpened and Battle Ready - suitable for heavy duty backyard cutting and display. 5160 Hand Sharpened Spring Steel Blade, Dual Tempered with an edge HRC of 60 and core HRC of 50. Mild Steel Fittings. Wood core leather wrapped handle and scabbard. Peened pommel for additional durability. FREE SHIPPING to the USA and Canada from Manufacturers warehouse in Quebec, Canada via Fed Ex. Please allow up to a week for sharpening and shipping. We apologize for the inconvenience, but due to the extreme shipping costs Darksword Armory swords can no longer be shipped to non USA or Canadian addresses.